Frost Advisory for Inland South Florida Through Thursday at 9 A.M.
NBC 6 Chief Meteorologist John Morales said much of the region affected by the frost advisory is in inland Miami-Dade County. The National Weather Service issued a frost advisory for inland South Florida Wednesday night that will last through Thursday morning. The advisory, which includes inland areas of Miami-Dade, Broward and Palm Beach counties, will be in effect until Thursday at 9 a.m., the National Weather Service said. Much of the region affected by the frost advisory is in inland Miami-Dade, west of Krome Avenue and Florida’s Turnpike – and especially in the areas south of the Tamiami Trail, through the Redland and down to Homestead. The advisory is also in effect in Broward west of U.S. 27, and covers mainland Monroe County and coastal Collier County. With temperatures running a bit cooler than initially forecasted, temps should fall into the mid-30s by sunrise on Thursday over the eastern interior areas, the Redland in Miami-Dade, and the west coast metro areas of Collier, the National Weather Service said. 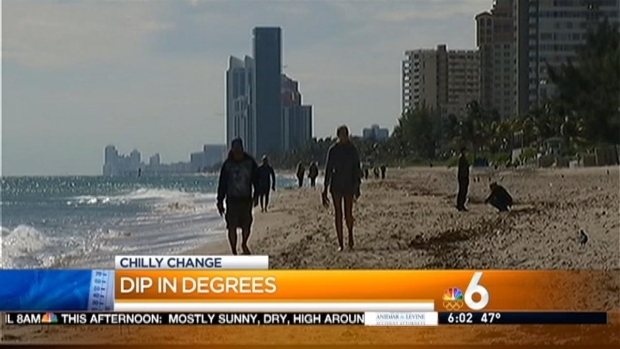 Locals and tourists woke up to temperatures in the 40s in South Florida Friday, some of the coolest weather to hit the region in nearly a year. The possible frost may damage agricultural concerns, and sensitive outdoor plants may be killed if they are left uncovered, the agency said.